Defending champions Egypt are seeded to retain the WSF Men’s World Team Squash Championship title next month after a projected final meeting with former champions England in what would be a repeat of the 2011 final. Teams from 31 nations – with representation from all five continents in the top sixteen alone – will contest the biennial championships which will be held in France for the first time in the event’s 46-year history. The 24th WSF Men’s World Team Championship, hosted by the Fédération Française de Squash, will be held from 9-15 June in Mulhouse, at both the Espace Squash 3000 Centre and the Palais Des Sports – where action will take place on three all-glass showcourts, with stunning presentation assured. With a squad featuring four players from the PSA world top ten – led by world number one and world champion Ramy Ashour – Egypt are firm favourites to win the title for the third time in a row, and the fourth time since 1999. 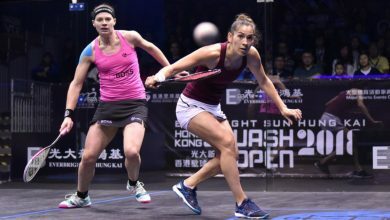 However England – led by world No2 Nick Matthew and also including fellow Yorkshireman James Willstrop, the world No4 – will be determined to make up for the disappointment of the 2011 defeat in Germany by taking the title for the fifth time since 1995. Hosts France, runners-up in 2009 and led by world No3 Gregory Gaultier, are the event’s No3 seeds, while record eight-time champions Australia are the fourth seeds. Botswana and Poland will be making their first appearances in the championship.